Jason made us a batch of these muffins this morning before work. Alex (my 4 year old) helped him crack the eggs and add some of the ingredients to the mix. Getting kids involved in the process pays big dividends because they are always proud of what they’ve made and more eager to eat the food. He got this recipe from ChefShaneKelly.com and the following recipe is literally taken word for word from her blog. Hope you enjoy these as much as we did! Preheat oven to 325°F. 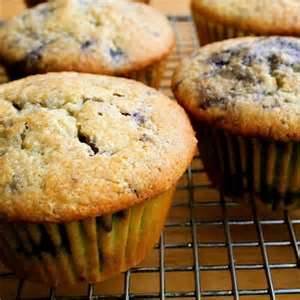 Place unbleached muffin cups (I use parchment paper muffin cups from Planet Organic) in muffins pans. In a medium mixing bowl use either a whisk or electric mixer and combine the eggs, honey, butter, vanilla, baking soda, sea salt and lemon zest. With a spatula fold in the almond flour, pecans and blueberries. Batter will be very firm so you’ll need to use a spoon to evenly divide the batter amonst the 12 muffin cups. Place 2-3 blueberries on top and press down into the batter…just because it looks pretty! Bake for 20-25 minutes. Toothpick should come out clean and they should be a nice golden brown…cool a bit and chow down! Thank you for posting this. I had saved the recipe on Pinterest and just discovered that the link to it on chef Shane Kelly is no longer working, so I was happy to find it here!